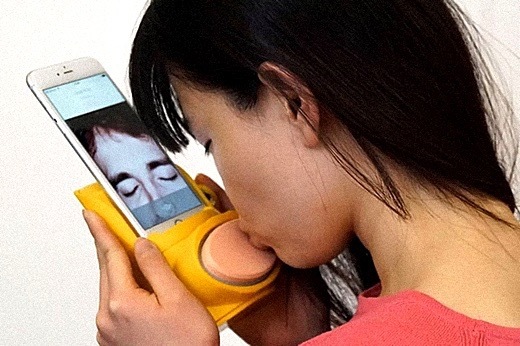 SUBHEAD: The Kissenger allows your iPhone to simulate kissing your long-distance lover. Image above: The hardware that allows an cell phone to replace a lover. From original article. 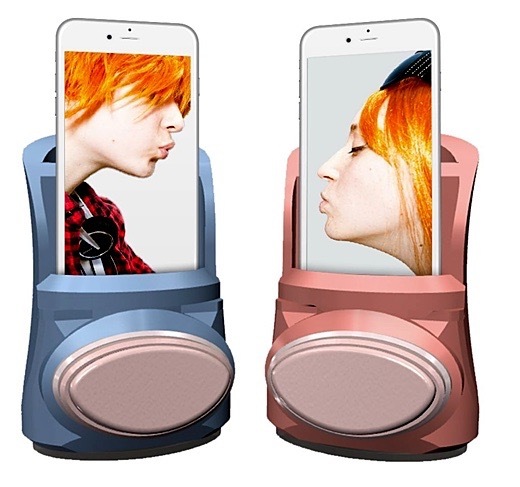 Touted as Earth's "first mobile kiss messenger," Kissenger is a rubbery-looking dock that humans put their phones in. It has a tactile surface they depress with their meat. The movements are then transmitted in realtime over the internet, so that a replica of them may be experienced by another human. Plug in to your phone and give your loved ones a kiss over the Internet. Kissenger can sense your kiss and transmit realistic kissing sensations to your partner in real time. You can also feel the force on your lips when your partner kisses you back. Share an intimate moment with your friends and families while chatting with them on your phone. The device comprises six sensors, corresponding actuators, and a meat-colored silicone sheath. There's an app that goes with it so the humans can interact on a audiovisual-discursive level at the same time. It's at the prototype stage with nothing to buy, yet, but obviously we should keep an eye on this. It should suffice to say that our previous recommendations with respect to establishing contact with this species have not changed. High precision force sensors are embedded under the silicon lip to measure the dynamic forces at different parts of your lips during a kiss. The device sends this data to your phone, which transmits it to your partner over the Internet in real time. Miniature linear actuators are used to reproduce these forces on your partner's lips, creating a realistic kissing sensation. Kissenger provides a two-way interaction just like in a real kiss. You can also feel your partner's kiss on your lips when they kiss you back. SUBHEAD: Editorial on necessity of communal solutions to intractable problem of Global Warming. 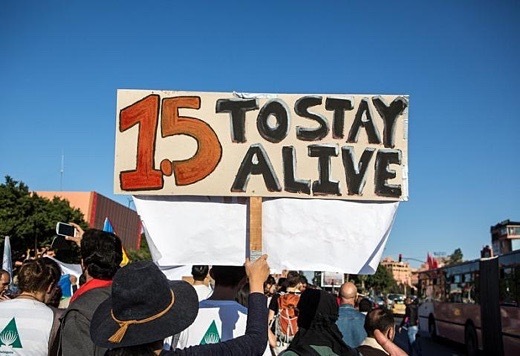 Image above: Climate activists hold sign reading "1.5 to Stay Alive" referring to rise in centigrade temperature rise that insures life remains on Earth. From original article. COP22 again highlighted the mismatch between illusive policy making and the stark reality of global warming. As always, it was left to civil society groups to uphold a vision of global cooperation and economic sharing as the only path towards a sustainable future. As 2016 draws to a close, we appear to be living in a world that is increasingly defined by its illusions, where the truth is a matter of subjective interpretation or argumentative debate. Indeed, following the United States election and Brexit referendum there is much talk of a new era of post-truth politics, in which appeals to emotion count more than verifiable facts. But there are some facts that cannot be ignored for much longer, however hard we may try. And the greatest of all these facts is the escalating climate emergency that neither mainstream politicians, nor the public at large, are anywhere near to confronting on the urgent scale needed. This was brought home once again at the latest Conference of the Parties held in Morocco last month, following the so-called ‘historic’ Paris Agreement of November 2015. Dubbed the ‘implementation’ or ‘action COP’, the main purpose of the summit was to agree the rules for implementing the new agreement, as few countries have set out concrete plans for how they will achieve future emissions reductions post-2020. Far from justifying its nickname, however, the almost 200 nations participating in COP22 decided that the overarching goals and framework for international climate action will not be completed until 2018, with a mere review of progress in 2017. Before the talks even commenced, the latest ‘emissions gap’ report from the UN Environment Programme (UNEP) highlighted the continued divergence between political and environmental/scientific reality. According to UNEP’s analysis, the non-binding pledges made by governments in Paris could see temperatures rise by 3.4°C above pre-industrial levels this century, far beyond the 2°C considered a minimally safe upper limit. To hit the more realistic 1.5°C target—which in itself will only mitigate, rather than eliminate severe climate impacts—the world must dramatically step up its ambition within the next few years before we use up the remaining carbon budget. Yet this reality was not even a key focus of the COP22 discussions, where most delegates from developed countries spoke mainly of their post-2020 commitments, as if the deadline for an emergency mobilisation of effort can be postponed by another few years. Ironically, several developed countries have not even ratified the second commitment period of the Kyoto Protocol, which comprises the pre-2020 period. So after 24 years of negotiations, we are still heading towards a future that is “incompatible with an organised global community”, with no sign that the mismatch between rhetoric and action is near to closing. As always, it was left to civil society groups to uphold the real hope and vision for how nations can begin traversing a path towards 1.5°C. In an updated report for COP22, a coalition of campaigning organisations outlined the last chance we have of halting our race to environmental disaster, which will require massive emissions reductions before 2020 and major shifts in the real economy. All of these transformations are technically viable and economically practicable, despite their apparent political infeasibility—such as a fossil energy investment and development moratorium; a necessary shift to agro-ecological farming practices; and a planned global transition to 100% renewable energy. What remains central to achieving an effective programme of action, however, is a degree of international cooperation and economic sharing that is unprecedented in human history. Such is the implicit message of both the 2016 and 2015 civil society equity reviews, which give a compelling justification for integrating the principle of ‘fair shares’ into a global effort-sharing framework. Using an equity modelling approach based on domestic mitigation pledges and indicators for capacity and historical responsibility, the reports show how developed countries are offering a share of effort that is markedly less ambitious than developing countries. Moreover, both reports demonstrate how developed countries have fair share obligations that are too large to be fulfilled solely within their own borders, even with extremely ambitious domestic actions. So there is a moral, political and economic case for the wealthiest nations to vastly scale up their help to poorer countries in terms of international finance, technology sharing, and capacity-building support. Put simply, campaigning organisations have used the most up-to-date scientific data to back up the argument that there cannot be hope for limiting global warming unless the principles of sharing, justice and equity are operationalised in a multilateral climate regime. But it is also an argument based on common sense and fundamental notions of fairness, given the urgency of drastically cutting global emissions within the context of interdependent nations at starkly disparate levels of economic and material development. Of course, there is no sign that those countries with a higher capacity to act than others are facing up to their obligations to redistribute massive technological and financial resources to developing countries, thus enabling them to leapfrog onto rapid, low-carbon development paths. Activists at COP22 used the slogan “WTF?” to ask “Where’s The Finance?”, as only between $18 billion and $34 billion has been granted of the $100 billion per year that developed countries committed to find by 2020. A supposed “$100 Billion Roadmap” from the OECD was roundly debunked by both developing countries and civil society for using misleading numbers and various accounting tricks. All the while, new analysis shows that the true needs of the world’s poorest countries is in the realm of trillions of dollars, if they are to plausibly meet their Paris pledges by 2030 and help avoid catastrophic warming. But no increases in public financial contributions were forthcoming in Morocco, pushing any substantive decisions on the issue back for another two years. So once again, we are left to wonder at the mismatch between illusive policymaking and the stark reality of global warming. 2016 broke all previous records for being the hottest year, while military leaders warned that climate change is already the greatest security threat of the 21st century, potentially leading to refugee problems on an unimaginable scale. Yet developed countries continue to evade and postpone their responsibilities for mobilising an appropriate response, while often making decisions on national infrastructure and energy that directly contradict their putative climate change commitments. Whether or not the United States withdraws from the Paris accords or the United Nations Framework Convention on Climate Change (UNFCCC) altogether, the prospect of global carbon emissions beginning to decline before 2020 currently remains dim, to say the least. Still none of this changes the core reality, which has remained the same ever since the UNFCCC negotiations began in the early 1990s. For there can be no hope of real and meaningful progress on tackling climate change, without a major commitment to North-South cooperation based upon a fairer sharing of global resources. The simple truth is unavoidable, but time is running out before the world finally embraces its momentous implications. COP22 again highlighted the mismatch between illusive policymaking and the stark reality of global warming. As always, it was left to civil society groups to uphold a vision of global cooperation and economic sharing as the only path towards a sustainable future. As 2016 draws to a close, we appear to be living in a world that is increasingly defined by its illusions, where the truth is a matter of subjective interpretation or argumentative debate. Indeed, following the United States election and Brexit referendum there is much talk of a new era of post-truth politics, in which appeals to emotion count more than verifiable facts. But there are some facts that cannot be ignored for much longer, however hard we may try. And the greatest of all these facts is the escalating climate emergency that neither mainstream politicians, nor the public at large, are anywhere near to confronting on the urgent scale needed. This was brought home once again at the latest Conference of the Parties held in Morocco last month, following the so-called ‘historic’ Paris Agreement of November 2015. Dubbed the ‘implementation’ or ‘action COP’, the main purpose of the summit was to agree the rules for implementing the new agreement, as few countries have set out concrete plans for how they will achieve future emissions reductions post-2020. Far from justifying its nickname, however, the almost 200 nations participating in COP22 decided that the overarching goals and framework for international climate action will not be completed until 2018, with a mere review of progress in 2017. Before the talks even commenced, the latest ‘emissions gap’ report from the UN Environment Programme (UNEP) highlighted the continued divergence between political and environmental/scientific reality. According to UNEP’s analysis, the non-binding pledges made by governments in Paris could see temperatures rise by 3.4°C above pre-industrial levels this century, far beyond the 2°C considered a minimally safe upper limit. To hit the more realistic 1.5°C target—which in itself will only mitigate, rather than eliminate severe climate impacts—the world must dramatically step up its ambition within the next few years before we use up the remaining carbon budget. Yet this reality was not even a key focus of the COP22 discussions, where most delegates from developed countries spoke mainly of their post-2020 commitments, as if the deadline for an emergency mobilisation of effort can be postponed by another few years. Ironically, several developed countries have not even ratified the second commitment period of the Kyoto Protocol, which comprises the pre-2020 period. So after 24 years of negotiations, we are still heading towards a future that is “incompatible with an organised global community”, with no sign that the mismatch between rhetoric and action is near to closing. As always, it was left to civil society groups to uphold the real hope and vision for how nations can begin traversing a path towards 1.5°C. In an updated report for COP22, a coalition of campaigning organisations outlined the last chance we have of halting our race to environmental disaster, which will require massive emissions reductions before 2020 and major shifts in the real economy. All of these transformations are technically viable and economically practicable, despite their apparent political infeasibility—such as a fossil energy investment and development moratorium; a necessary shift to agro-ecological farming practices; and a planned global transition to 100% renewable energy. What remains central to achieving an effective programme of action, however, is a degree of international cooperation and economic sharing that is unprecedented in human history. Such is the implicit message of both the 2016 and 2015 civil society equity reviews, which give a compelling justification for integrating the principle of ‘fair shares’ into a global effort-sharing framework. Using an equity modelling approach based on domestic mitigation pledges and indicators for capacity and historical responsibility, the reports show how developed countries are offering a share of effort that is markedly less ambitious than developing countries. Moreover, both reports demonstrate how developed countries have fair share obligations that are too large to be fulfilled solely within their own borders, even with extremely ambitious domestic actions. So there is a moral, political and economic case for the wealthiest nations to vastly scale up their help to poorer countries in terms of international finance, technology sharing, and capacity-building support. Of course, there is no sign that those countries with a higher capacity to act than others are facing up to their obligations to redistribute massive technological and financial resources to developing countries, thus enabling them to leapfrog onto rapid, low-carbon development paths. Activists at COP22 used the slogan “WTF?” to ask “Where’s The Finance?”, as only between $18 billion and $34 billion has been granted of the $100 billion per year that developed countries committed to find by 2020. A supposed “$100 Billion Roadmap” from the OECD was roundly debunked by both developing countries and civil society for using misleading numbers and various accounting tricks. All the while, new analysis shows that the true needs of the world’s poorest countries is in the realm of trillions of dollars, if they are to plausibly meet their Paris pledges by 2030 and help avoid catastrophic warming. But no increases in public financial contributions were forthcoming in Morocco, pushing any substantive decisions on the issue back for another two years. So once again, we are left to wonder at the mismatch between illusive policymaking and the stark reality of global warming. 2016 broke all previous records for being the hottest year, while military leaders warned that climate change is already the greatest security threat of the 21st century, potentially leading to refugee problems on an unimaginable scale. Yet developed countries continue to evade and postpone their responsibilities for mobilising an appropriate response, while often making decisions on national infrastructure and energy that directly contradict their putative climate change commitments. Whether or not the United States withdraws from the Paris accords or the United Nations Framework Convention on Climate Change (UNFCCC) altogether, the prospect of global carbon emissions beginning to decline before 2020 currently remains dim, to say the least. Still none of this changes the core reality, which has remained the same ever since the UNFCCC negotiations began in the early 1990s. For there can be no hope of real and meaningful progress on tackling climate change, without a major commitment to North-South cooperation based upon a fairer sharing of global resources. The simple truth is unavoidable, but time is running out before the world finally embraces its momentous implications. Is Grizzly Steppe a joke? SUBHEAD: No,Grizzley Steppe is not a locale in Yellowstone Park or a Chippandale dancer's name. It's just propaganda. 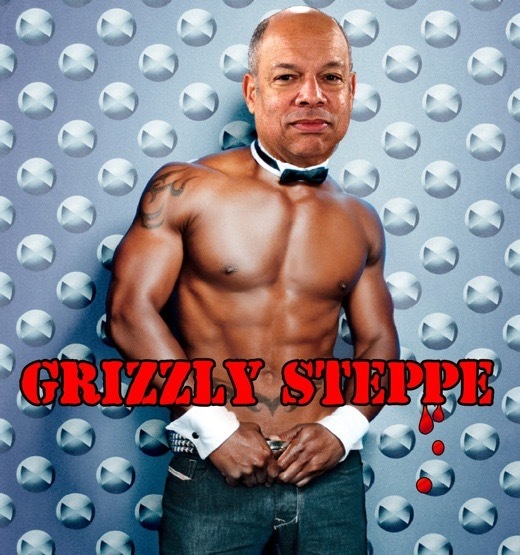 Image above: Jeh Johnson, Director of the Department of Homeland Security under cover as male stripper "Grizzly Steppe" of Chipendale's. From Wikipedia and (https://s-media-cache-ak0.pinimg.com/originals/d1/64/ba/d164ba23e6e8a95d8f29ae33813c23e7.jpg). Mashup by Juan Wilson. Critics still see holes in US 'Evidence' of Russian election interference. Like the Bush administration's claims of Iraqi WMDs, the charges that Russia 'hacked' the presidential election in November have not been established beyond secret intelligence sources. As the U.S. expels 35 Russian diplomats over hacking charges, critics say the so-called evidence released Thursday alongside President Barack Obama's sanctions is an insufficient response to calls for hard proof of the allegations. The FBI/Department of Homeland Security Joint Analysis Report "Grizzly Steppe" (pdf), published as part of the White House's response to alleged Russian government interference in the 2016 election process, "adds nothing to the call for evidence that the Russian government was responsible for hacking the [Democratic National Committee, or DNC], the [Democratic Congressional Campaign Committee], the email accounts of Democratic party officials, or for delivering the content of those hacks to WikiLeaks," wrote cybersecurity expert Jeffrey Carr on Friday. The brief report "merely listed every threat group ever reported on by a commercial cybersecurity company that is suspected of being Russian-made and lumped them under the heading of Russian Intelligence Services (RIS) without providing any supporting evidence that such a connection exists," Carr said. If the White House had unclassified evidence that tied officials in the Russian government to the DNC attack, they would have presented it by now. The fact that they didn't means either that the evidence doesn't exist or that it is classified. If it's classified, an independent commission should review it because this entire assignment of blame against the Russian government is looking more and more like a domestic political operation run by the White House that relied heavily on questionable intelligence generated by a for-profit cybersecurity firm with a vested interest in selling "attribution-as-a-service." In fact, cyber-expert Robert M. Lee, in his posted critique on Friday, noted that the FBI/DHS report "is intended to help network defenders; it is not the technical evidence of attribution." As such, Lee argued, it is likely to "confuse readers" who are seeking such evidence. Video above: Jordan Chiriton From (https://youtu.be/snJin79SbaU). Words don't exist for how low it is to depict someone as a Kremlin agent or traitor for questioning adequacy of evidence for USG assertions. Like Greenwald, author and media critic Howard Friel sees parallels between the lead-up to the U.S. invasion of Iraq and the current "unconfirmable claims" of Russian election interference. "Like the Bush administration's claims of Iraqi [weapons of mass destruction], the charges that Russia 'hacked' the presidential election in November have not been established beyond secret intelligence sources, which have been treated and printed by the New York Times as impeccable," Friel wrote on Friday. Just as the Times editorial page in February 2003 had no basis for concluding that Colin Powell's presentation at the UN was "the most powerful case to date" that Iraq possessed WMD, the Times today has no confirmable basis for concluding that "there should be no doubt" that Russia hacked the presidential election last month or that President Obama has any basis for "punishing Russia," which in any event is unprofessional and jingoistic journalistic usage from the leading newspaper in the United States. Yet, it reflects the warlike tone and tenor of the liberal political and journalistic establishments, led by the New York Times, which seems determined to drive us over the cliff once again toward war. Meanwhile, Russian President Vladimir Putin said Friday he would not expel any U.S. diplomats in retaliation for Obama's moves—"a surprisingly calm reaction," as the Guardian described, "that appears to be designed as an overture to the incoming U.S. president, Donald Trump." SUBHEAD: Italy urges Europe to begin censoring free speech on the internet. US to attack "Fake News". 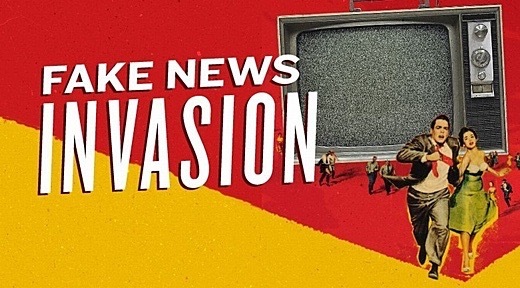 Image above: 'Invasion of the Fake News" mashup from "Invasion of the Body Snatchers". The war on "Fake News" is all about censoring real news. From (http://truepundit.com/the-war-on-fake-news-is-all-about-censoring-real-news/). First it was the US, then Germany blamed much of what is wrong in society on "fake news", and not, say, a series of terrible decisions made by politicians. Now it is Italy's turn to call for an end to "fake news", which in itself would not be troubling, however, the way Giovanni Pitruzzella, head of the Italian competition body, demands the European Union "cracks down" on what it would dub "fake news" is nothing short of a total crackdown on all free speech, and would give local governments free reign to silence any outlet that did not comply with the establishment propaganda. In an interview with the FT, Pitruzzella said the regulation of false information on the internet was best done by the state rather than by social media companies such as Facebook, an approach taken previously by Germany, which has demanded that Facebook end "hate speech" and has threatened to find the social network as much as €500K per "fake" post. Pitruzzella, head of the Italian competition body since 2011, said "EU countries should set up independent bodies — co-ordinated by Brussels and modeled on the system of antitrust agencies — which could quickly label fake news, remove it from circulation and impose fines if necessary." In other words, a series of unelected bureaucrats, unaccountable to anyone, would sit down and between themselves decide what is and what isn't "fake news", and then, drumroll, "remove it from circulation." On the other hand, coming one week after Obama give Europe the green light to engage in any form of censorship and halt of free speech that it desires, when the outgoing US president voted into law the "Countering Disinformation And Propaganda Act", it should come as no surprise that a suddenly emboldened Europe is resorting to such chilling measures. So with Europe on the verge of rolling out unbridled censorship, here is the strawman used to justify it. Translation: it will soon be up to Brussles to decide what content on the Internet is appropriate for broad European consumption, because unless a bureaucrat intervenes "fake news" will lead to even more populism and not, say, years of failed political reform, and central bank decisions. In short, it's all the internet's fault that Europe's legacy political system is reeling from an unprecedented anti-establishment backlash, which has nothing to do with, well, anything else. As the FT notes, Pitruzzella’s call comes amid growing concern over the impact of fake news on politics in western democracies, including in this year’s UK Brexit vote and the US election. In Germany, which faces parliamentary elections in 2017, the government is planning a law that would impose fines of up to €500,000 on social media companies for distributing fake news. Allies of Matteo Renzi, the former prime minister, have also complained that fake news contributed to his defeat in the December referendum on constitutional reform, which led to his resignation, even though he lost by a wide 20-percentage point margin. At least they haven't blamed Russian hackers... yet. So even assuming limiting free speech is the answer, why not force potential offenders to companies to police themselves? Well, according to Pitruzzella it would be inappropriate to leave this task to social media self-regulation. “Platforms like Facebook have created great benefits for people and customers: they are doing their part as an economic entity in adopting policies to modify their algorithms to reduce this phenomenon”, he said. “But it is not the job of a private entity to control information. We know of at least one Italian who would agree. And just like the person shown above, Pitruzzella dismissed concerns that setting up state agencies to monitor fake news would introduce a form of censorship, saying people could “continue using a free and open internet”... as long as all the members of the "open" internet agreed with what the agencies determined to be true and undisputed. But he said there would be a benefit in that there would be a public “third party” — independent of the government — to “intervene quickly if public interests were harmed”. At the moment, the only way that fake news can be tackled — at least in Italy — is through the judicial system, which is notoriously clunky. “Speed is a critical element,” Pitruzzella said, so what is the solution? Why a Ministry of Truth of course. The anti-establishment Five Star Movement is often labelled as the main facilitator of fake news in Italy, through the blog of its founder, the comedian Beppe Grillo, and a network of other websites affiliated to the party. Of course, once free speech is censored, Pitruzzella will have no problem with no only criticizing anyone who disagrees with him, but promptly shutting down their freedom of speech on the net. 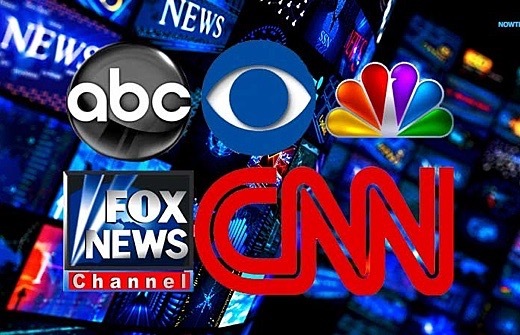 Image above: Source of US government propaganda includes "Fake News" in Mainstream Media. The FaceBook response on December 15th 2016 was announcement it will begin censoring stories they feel constitute "Fake News". From (http://www.nowtheendbegins.com/zuckerberg-announces-facebook-will-now-begin-censoring-stories-feel-constitute-fake-news/). SUBHEAD: New proposal for Hawaii ferry faces economic challenges public opinion hurdles. 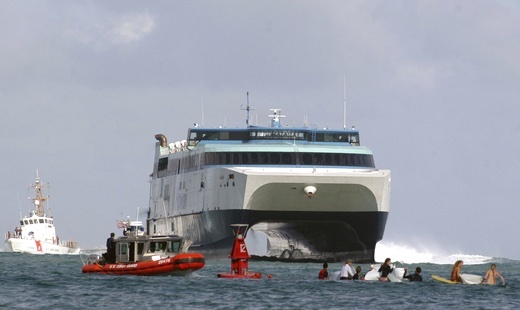 Image above: In this December 13, 2007, file photo, Hawaii's Superferry makes its entry into the Kahalui Harbor escorted by the U. S. Coast Guard and heavy law enforcement surveillance. From original article. 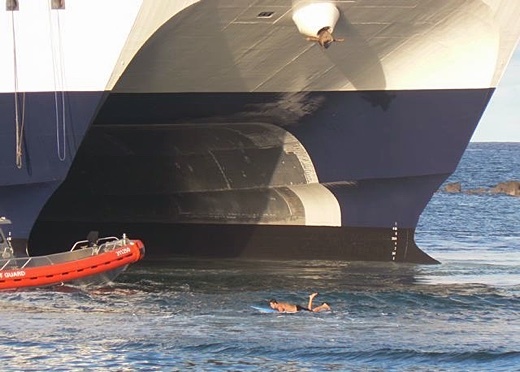 When a 30-foot-tall ferry loomed outside a Kauai harbor in 2007, surfers and kayakers — looking like tiny ducks in comparison — blocked its path, preventing it from unloading hundreds of passengers and sending the giant catamaran back to Oahu. The emotional standoff where surfers bobbed in the water for hours marked the end to an expensive failure in Hawaii's history: the Superferry. Now the state is exploring bringing back a ferry to run between islands, facing skepticism over financing and whether there's a ferry system residents would accept. Lawmakers approved $50,000 in May to study a possible inter-island ferry, and the state Department of Transportation received a $500,000 grant from the federal Maritime Administration to hire consultants to explore potential routes and boats. "The feasibility study might come back and say maybe it's not financially feasible for us to do this," said Ford Fuchigami, director of the state Transportation Department. "But right now, using federal money which is available ... we want to be sure that we use that money to see whether or not this is possible." The Hawaii Superferry ran primarily between Oahu and Maui from 2007 until 2009, but was shut down after a judge ruled the state broke the law by not completing required environmental reviews. It was a costly gamble. Hawaii spent at least $34 million on equipment for the ferry, which it later sold for just $425,000. The barges and ramps were custom-made for the Superferry, complicating the sale, said Tim Sakahara, Department of Transportation spokesman. Image above: In this August 26th 2007 photo by Jonathan Jay protesters kept the Hawaii Superferry from docking in Kauai. Here a surfer stops the Superferry in Nawiliwili Harbor as a Coast Guard vessel attempts to grapple the surfer. Hawaii Superferry filed for bankruptcy, leaving $136.8 million in debt to the Maritime Administration — which repossessed the ferries — and a $22.9 million debt to Austal USA, which built two ferries for Hawaii for $190 million. The Navy later paid the Maritime Administration just $35 million to buy both ships. One now serves as a ferry between Maine and Nova Scotia. "In the beginning, people believed what they were reading, that it was going to be this really low-cost way to go inter-island and it sounded like a great thing," said Irene Bowie, former executive director of the Maui Tomorrow Foundation, which opposed the ferry based on environmental concerns. "But the devil is always in the details." The new study will explore public or private ownership of vessels and operations. If the state owns the vessels, it could get federal subsidies, Fuchigami said. But it might be cheaper for a third party to operate a ferry system, he said. "Almost no ferry system in the country is self-sustaining," said Lauren Brand, an associate administrator for the Maritime Administration. "The vast majority of them have to have public dollars to help them keep on." Washington State's ferry system, which Fuchigami has identified as a potential model for Hawaii, gets about 30 percent of its operating costs from subsidies and 70 percent from the fare box, ferry experts said. The Staten Island Ferry in New York, where customers ride for free, is also subsidized by taxpayers. Hawaii's open ocean geography, deadly channels and protected marine life pose unique challenges. But Hawaii can learn from ferry systems operating in the Greek Islands, the Philippines and between Argentina and Uruguay, said David Moseley, a former director of Washington Ferries and senior consultant with Carus, a firm that may compete to conduct the Hawaii study. 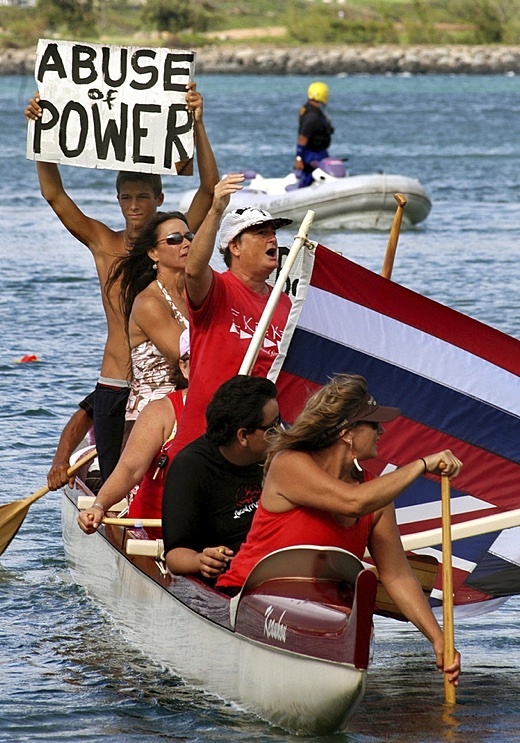 Image above: In this Dec. 15, 2007, file photo, a group of people ride in a canoe near the ferry arrival in Kahalui Harbor during a protest against the Superferry "Alakai" in Maui, Hawaii. And a court later ordered the ferry to stop running because the state didn't do a proper environmental review. From original article. "There are places all over the world where ferry systems with similar situations to Hawaii are operating very successfully," Moseley added. Fuchigami is considering a red-eye trip from Honolulu to Hawaii Island and inter-island trips from Oahu to Kauai and Maui. He also wants commuter ferries on Oahu and Maui. "Everyone talks about traffic," Fuchigami said, proposing a ferry from Oahu's West side — where homes are less expensive — into urban Honolulu. To ensure a steady revenue stream, Fuchigami hopes inter-island ferries could carry cargo such as farm produce. "The main thing is that we're going to be very, very careful," Fuchigami said. Superferry wasn't the only failed sea vessel attempt in Hawaii. In 2009, the same year the Superferry shut down, Honolulu ended a passenger ferry service called "TheBoat" which shuttled passengers between downtown Honolulu and West Oahu for $2. "It didn't really attract ridership," said Michael Hansen, president of the Hawaii Shippers Council. "Most of the people being carried were just tourists taking a boat ride." A ferry running from Molokai to Maui shut down this year amid financial losses. The Sierra Club, which opposed the Superferry, worries ferries could spread invasive species and rapid ohia death, a fungal disease killing native ohia trees, said director Marti Townsend. "If there is a way to operate a ferry that can guarantee against the spread of invasive species, then we will keep an open mind, but from what we know now, it's an inherent fatal flaw," she said. SUBHEAD: A review of last year's predictions for 2016 and some new predictions for 2017. 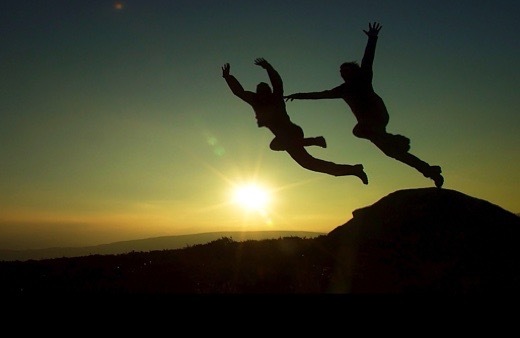 Image above: Photo of two who leap into the dark. From (https://www.flickr.com/photos/stuant63/3152875867/in/photostream/). A few days from now, 2016 will have passed into the history books. I know a fair number of people who won’t mourn its departure, but it’s pretty much a given that the New Year celebrations here in the United States, at least, will demonstrate a marked shortage of enthusiasm for the arrival of 2017. There’s good reason for that, and not just for the bedraggled supporters of Hillary Clinton’s failed and feckless presidential ambitions. None of the pressures that made 2016 a cratered landscape of failed hopes and realized nightmares have gone away. Indeed, many of them are accelerating, as the attempt to maintain a failed model of business as usual in the teeth of political, economic, and environmental realities piles blowback upon blowback onto the loading dock of the new year. Before we get into that, though, I want to continue the annual Archdruid Report tradition and review the New Year’s predictions that I made at the beginning of 2016. Those of my readers who want to review the original post will find it here. Here’s the gist. “Thus my core prediction for 2016 is that all the things that got worse in 2015 will keep on getting worse over the year to come. The ongoing depletion of fossil fuels and other nonrenewable resources will keep squeezing the global economy, as the real (i.e., nonfinancial) costs of resource extraction eat up more and more of the world’s total economic output, and this will drive drastic swings in the price of energy and commodities—currently those are still headed down, but they’ll soar again in a few years as demand destruction completes its work. The empty words in Paris a few weeks ago will do nothing to slow the rate at which greenhouse gases are dumped into the atmosphere, raising the economic and human cost of climate-related disasters above 2015’s ghastly totals—and once again, the hard fact that leaving carbon in the ground means giving up the lifestyles that depend on digging it up and burning it is not something that more than a few people will be willing to face. “Meanwhile, the US economy will continue to sputter and stumble as politicians and financiers try to make up for ongoing declines in real (i.e., nonfinancial) wealth by manufacturing paper wealth at an even more preposterous pace than before, and frantic jerryrigging will keep the stock market from reflecting the actual, increasingly dismal state of the economy. It’s almost superfluous to point out that I called it. It’s been noted with much irritation by other bloggers in what’s left of the peak oil blogosphere that it takes no great talent to notice what’s going wrong, and point out that it’s just going to keep on heading the same direction. This I cheerfully admit—but it’s also relevant to note that this method produces accurate predictions. Meanwhile, the world-saving energy breakthroughs, global changes in consciousness, sudden total economic collapses, and other events that get predicted elsewhere year after weary year have been notable by their absence. I quite understand why it’s still popular to predict these things: after all, they allow people to pretend that they can expect some future other than the one they’re making day after day by their own actions. Nonetheless, the old saying remains true—“if you always do what you’ve always done, you’ll always get what you’ve always gotten”—and I wonder how many of the people who spend each year daydreaming about the energy breakthroughs, changes in consciousness, economic collapses, et al, rather than coming to grips with the rising spiral of crises facing industrial civilization, really want to deal with the future that they’re storing up for themselves by indulging in this habit. Let’s go on, though. At the beginning of 2016, I also made four specific predictions, which I admitted at the time were long shots. One of those, specific prediction #3, was that the most likely outcome of the 2016 presidential election would be the inauguration of Donald Trump as President in January 2017. I don’t think I need to say much about that, as it’s already been discussed here at length. The only thing I’d like to point out here is that much of the Democratic party seems to be fixated on finding someone or something to blame for the debacle, other than the stark incompetence of the Clinton campaign and the failure of Democrats generally to pay attention to anything outside the self-referential echo chambers of affluent liberal opinion. If they keep it up, it’s pretty much a given that Trump will win reelection in 2020. The other three specific long-shot predictions didn’t pan out, at least not in the way that I anticipated, and it’s only fair—and may be helpful, as we head further into the unknown territory we call 2017—to talk about what didn’t happen, and why. Specific prediction #1 was that the next tech bust would be under way by the end of 2016. That’s happening, but not in the way I expected. Back in January I was looking at the maniacally overinflated stock prices of tech companies that have never made a cent in profit and have no meaningful plans to do so, and I expected a repeat of the “tech wreck” of 2000. The difficulty was simply I didn’t take into account the most important economic shift between 2000 and 2016—the de facto policy of negative interest rates being pursued by the Federal Reserve and certain other central banks. That policy’s going to get a post of its own one of these days, because it marks the arrival of a basic transformation in economic realities that’s as incomprehensible to neoliberal economists as it will be challenging to most of the rest of us. The point I want to discuss here here, though, is a much simpler one. Whenever real interest rates are below zero, those elite borrowers who can get access to money on those terms are being paid to borrow. Among many other things, this makes it a lot easier to stretch out the downward arc of a failing industry. Cheaper-than-free money is one of the main things that kept the fracking industry from crashing and burning from its own unprofitability once the price of oil plunged in 2013; there’s been a steady string of bankruptcies in the fracking industry and the production of oil from fracked wells has dropped steadily, but it wasn’t the crash many of us expected. The same thing is happening, in equally slow motion, with the current tech bubble. Real estate prices in San Francisco and other tech hotspots are sliding, overpaid tech employees are being systematically replaced by underpaid foreign workers, the numbers are looking uglier by the week, but the sudden flight of investment money that made the “tech wreck” so colorful sixteen years ago isn’t happening, because tech firms can draw on oceans of relatively cheap funding to turn the sudden popping of the tech bubble into the slow hiss of escaping air. That doesn’t mean that the boom-and-bust cycle has been cancelled—far from it—but it does mean that shoveling bad money after good has just become a lot easier. Exactly how that will impact the economy is a very interesting question that nobody just now knows how to answer. Let’s move on. Specific prediction #2 was that the marketing of what would inevitably be called “the PV revolution” would get going in a big way in 2016. Those of my readers who’ve been watching the peak oil scene for more than a few years know that ever since the concept of peak oil clawed its way back out of its long exile in the wilderness of the modern imagination, one energy source after anobter has been trotted out as the reason du jour why the absurdly extravagant lifestyles of today’s privileged classes can roll unhindered into the future. I figured, based on the way that people in the mainstream environmentalist movement were closing ranks around renewables, that photovoltaic solar energy would be the next beneficiary of that process, and would take off in a big way as the year proceeded. That this didn’t happen is not the fault of the solar PV industry or its cheerleades in the green media. Naomi Oreskes’ strident insistence a while back that raising questions about the economic viability of renewable energy is just another form of climate denialism seems to have become the party line throughout the privileged end of the green left, and the industrialists are following suit. Elon Musk, whose entire industrial empire has been built on lavish federal subsidies, is back at the feed trough again, announcing a grandiose new plan to manufacture photovoltaic roof shingles; he’s far and away the most colorful of the would-be renewable-energy magnates, but others are elbowing their way toward the trough as well, seeking their own share of the spoils. The difficulty here is twofold. First, the self-referential cluelessness of the Democratic party since the 2008 election has had the inevitable blowback—something like 1000 state and federal elective offices held by Democrats after that election are held by Republicans today—and the GOP’s traditional hostility toward renewable energy has put a lid on the increased subsidies that would have been needed to kick a solar PV feeding frenzy into the same kind of overdrive we’ve already seen with ethanol and wind. Solar photovoltaic power, like ethanol from corn, has a disastrously low energy return on energy invested—as Pedro Prieto and Charles Hall showed in their 2015 study of real-world data from Spain’s solar PV program, the EROEI on large-scale grid photovoltaic power works out in practice to less than 2.5—and so, like nuclear power, it’s only economically viable if it’s propped up by massive and continuing subsidies. Lacking those, the “PV revolution” is dead in the water. The second point, though, is the more damaging. The “recovery” after the 2008-2009 real estate crash was little more than an artifact of statistical manipulation, and even negative interest rates haven’t been able to get a heartbeat going in the economy’s prostrate body. As most economic measurements not subject to fiddling by the enthusiastic accountants of the federal government slide steadily downhill, the economic surplus needed to support any kind of renewables buildout at all is rapidly tricking away. Demand destruction is in the driver’s seat, and the one way of decreasing fossil fuel consumption that affluent environmentalists don’t want to talk about—conservation—is the only viable option just now. Specific prediction #4 was that the Saudi regime in Arabia would collapse by the end of 2016. As I noted at the time, the replacement of the Saudi monarchy with some other form of government is for all practical purposes a done deal. Of the factors I cited then—the impending bankruptcy of a regime that survives only by buying off dissent with oil money, the military quagmires in Yemen, Syria, and Iraq that have the Saudi military and its foreign mercenaries bogged down inextricably, and the rest of it—none have gone away. Nor has the underlying cause, the ongoing depletion of the once-immense oil reserves that have propped up the Saudi state so far. That said, as I noted back in January, it’s anyone’s guess what cascade of events will send the Saudi royal family fleeing to refuges overseas while mobs rampage through their abandoned palaces in Riyadh, and some combination of mid-level military officers and Muslim clerics piece together a provisional government in their absence. I thought that it was entirely possible that this would happen in 2016, and of course it didn’t. It’s possible at this point that the price of oil could rise fast enough to give the Saudi regime another lease on life, however brief. That said, the winds are changing across the Middle East; the Russian-Iranian alliance is in the ascendant, and the Saudis have very few options left. It will be interesting, in the sense of the apocryphal Chinese curse, to see how long they survive. So that’s where we stand, as 2016 stumbles down the ramp into time’s slaughterhouse and 2017 prepares to take its place in the ragged pastures of history. What can we expect in the year ahead? To some extent, I’ve already answered that question—but only to some extent. Most of the factors that drove events in 2016 are still in place, still pressing in the same direction, and “more of the same” is a fair description of the consequences. Day after day, the remaining fossil fuel reserves of a finite planet are being drawn down to maintain the extravagant and unsustainable lifestyles of the industrial world’s more privileged inmates. Those remaining reserves are increasingly dirty, increasingly costly to extract and process, increasingly laden with a witch’s brew of social, economic, and environmental costs that nobody anywhere is willing to make the fossil fuel industry cover, and those costs don’t go away just because they’re being ignored—they pile up in society, the economy, and the biosphere, producing the rising tide of systemic dysfunction that plays so large and unmentioned a role in daily life today. Thus we can expect still more social turmoil, more economic instability, and more environmental blowback in 2017. The ferocious populist backlash against the economic status quo that stunned the affluent in Britain and America with the Brexit vote and Trump’s presidential victory respectively, isn’t going away until and unless the valid grievances of the working classes get heard and addressed by political establishments around the industrial world; to judge by examples so far, that’s unlikely to happen any time soon. At the same time, the mismatch between the lifestyles we can afford and the lifestyles that too many of us want to preserve remains immense, and until that changes, the global economy is going to keep on lurching from one crisis to another. Meanwhile the biosphere is responding to the many perturbations imposed on it by human stupidity in the way that systems theory predicts—with ponderous but implacable shifts toward new conditions, many of which don’t augur well for the survival of industrial society. There are wild cards in the deck, though, and one of them is being played right now over the North Pole. As I write this, air temperatures over the Arctic ice cap are 50°F warmer than usual for this time of year. A destabilized jet stream is sucking masses of warm air north into the Arctic skies, while pushing masses of Arctic air down into the temperate zone. As a result, winter ice formation on the surface of the Arctic ocean has dropped to levels tht were apparently last seen before our species got around to evolving—and a real possibility exists, though it’s by no means a certainty yet, that next summer could see most of the Arctic Ocean free of ice. Nobody knows what that will do to the global climate. The climatologists who’ve been trying to model the diabolically complex series of cascading feedback loops we call “global climate” have no clue—they have theories and computer models, but so far their ability to predict the rate and consequences of anthropogenic climate change have not exactly been impressive. For what it’s worth, by the way, most of their computer models have turned out to be far too conservative in their predictions. Nobody knows yet whether the soaring temperatures over the North Pole this winter are a fluke, a transitory phenomenon driven by the unruly transition between one climate regime and another, or the beginning of a recurring pattern that will restore the north coast of Canada to the conditions it had during the Miocene, when crocodiles sunned themselves on the warm beaches of northern Greenland. In the same way, the populist backlash mentioned above is a wild card whose effects nobody can predict just now. The neoliberal economics that have been welded into place in the industrial world for the last thirty years have failed comprehensively, that’s clear enough. The abolition of barriers to the flow of goods, capital, and population did not bring the global prosperity that neoliberal economists promised, and now the bill is coming due. The question is what the unraveling of the neoliberal system means for national economies in the years ahead. There are people—granted, these are mostly neoliberal economists and those who’ve drunk rather too freely of the neoliberal koolaid—who insist that the abandonment of the neoliberal project will inevitably mean economic stagnation and contraction. There are those who insist that the abandonment of the neoliberal project will inevitably mean a return to relative prosperity here in the US, as offshored jobs are forced back stateside by tax policies that penalize imports, and the US balance of trade reverts to something a little closer to parity. The fact of the matter is that nobody knows what the results will be. Here as in Britain, voters faced with a choice between the perpetuation of an intolerable status quo and a leap in the dark chose the latter, and the consequences of that leap can’t be known in advance. Other examples abound. The US president-elect has claimed repeatedly that the US under his lead will get out of the regime-change business and pursue a less monomaniacally militaristic foreign policy than the one it’s pursued under Bush and Obama, and would have pursued under Clinton. The end of the US neoconservative consensus is a huge change that will send shockwaves through the global political system. Another change, at least as huge, is the rise of Russia as a major player in the Middle East. Another? The remilitarization of Japan and its increasingly forceful pursuit of political and military alliances in East and South Asia. There are others. The familiar order of global politics is changing fast. What will the outcome be? Nobody knows. As 2017 dawns, in a great many ways, modern industrial civilization has flung itself forward into a darkness where no stars offer guidance and no echoes tell what lies ahead. I suspect that when we look back at the end of this year, the predictable unfolding of ongoing trends will have to be weighed against sudden discontinuities that nobody anywhere saw coming. We’re not discussing the end of the world, of course; we’re talking events like those that can be found repeated many times in the histories of other failing civilizations. That said, my guess is that some of those discontinuities are going to be harsh ones. Those who brace themselves for serious trouble and reduce their vulnerabilities to a brittle and dysfunctional system will be more likely to come through in one piece. Those who are about to celebrate the end of 2016, in other words, might want to moderate their cheering when it’s over. It’s entirely possible that 2017 will turn out to be rather worse—despite which I hope that the readers of this blog, and the people they care about, will manage to have a happy New Year anyway. SUBHEAD: And there’s no doubt that Trump is an iceberg-sized gamble, but a change had to come. 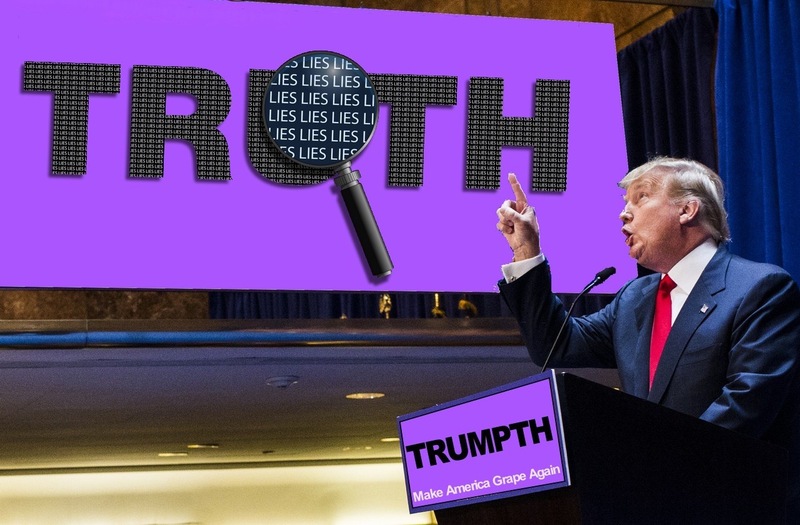 Image above: Donald Trump's version of reality is "Trumpth". Mashup by Juan Wilson. From (http://www.documentarytube.com/articles/7-scary-realities-for-americans-with-donald-trump-as-president). Click to embiggen. I haven’t kept count of the number of ‘articles’ the WaPo has published over the past year or so -the election campaign- that referred to unsubstantiated reports emanating from anonymous US intelligence sources about Russian involvement in everything bad under the sun, but I’m dead certain that put together they would add up to a Christmas bestseller of respectable size. A chance missed there, gents. You could have had your own garbage lead your own bestseller lists. Snake, tail. There may be fine individuals among them, that’s not even -the worst of- the point, it’s the dilapidated, decayed, rotten to the core institutions that they ‘serve’ which are the problem. They serve themselves and they serve the institutions, the one thing they sure don’t serve is the people. You know who’s given (‘voted’) them those lavish pensions and benefits? They themselves did, and their predecessors. The UN is supposed to keep the peace in the world. Well, works like a charm, doesn’t it? The IMF is tasked with keeping 200 or so nations in reasonably balanced economic conditions. Got it down. The US Congress was set up as a pillar of democracy, but it’s occupied by guys and gals who spend so much more time raising funds for their next campaign than representing those who voted them in, that they need lobbyists to tell them which way to vote. As for the EU, is it even possible they’re the worst of the bunch? Europe is falling apart before all of our eyes, and they’re all in full tard denial about it. They are turning Greece into a third world country, they’re alienating Britain to the point where the English will, once they wake up to what’s going on, want to set Brussels on fire. And why? There’s no point left to any of it at all. It’ll be much messier, for instance because in Holland last time I looked 81 different political parties were vying to take part in the upcoming elections, but the end result will be the same. That is, the existing order will be voted out. Not everywhere, and it won’t be replaced by radically different parties and people in all places, but do please understand that it doesn’t have to. In Europe, it’s not and/and, it’s if/or. As in, if either Italy or France or Holland vote in a party that wants to leave the EU or the Euro, it’s game over. The endgame will be almighty messed up because of all the laws and regulations the EU has invented, but eventually the walls of Brussels will crumble. And while everyone tries to talk you into thinking that’s terrible, there’s no reason why it should be. We can work together in many different ways. All these supranational institutions have merely become straight jackets that serve only the people who work inside them and those outside who benefit from keeping up appearances and clinging to power. That of course gets us back to the Washington Post and its comatose brethren. The US press has been a full accomplice with Washington in reporting fake news about the recovery, and it’s not there. Never has been. The Dow Jones says one thing, the votes for Trump say another. In the end, democracy is that simple. Same goes for Britain, same goes for continental Europe. See film "Answering the Call"
Hello Russia! Are you there?